Inhabits most of the southern two-thirds of the state, excluding the higher elevations. Range extends north into the Sacramento Valley and surrounding foothills (Chapman and Willner 1978). Abundant to common in grasslands, open forests, and desert shrub habitats (Hall 1946, Ingles 1965). Found in more open habitats than brush rabbits. 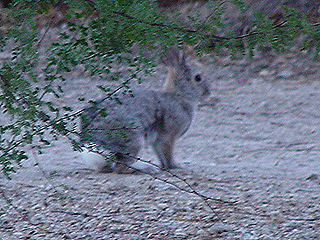 Feeding: Desert cottontails are herbivorous. They feed in most canopy-closure classes, but they prefer grasslands. They graze and browse on a wide variety of grasses, forbs, tree and shrub leaves, twigs, fallen fruit, acorns, and tender bark (Ingles 1965). Cover: Cottontails use rockpiles, fallen trees and logs, fence rows, thickets and patches of shrubs, vines, and brush as cover. Willow, blackberry, and wild grape are favorite coverts (Fitch 1947). Reproduction: Cottontails construct fur-lined nests on the ground or in burrows, usually within dense shrub stands. Pattern: Good habitats for cottontails contain small, scattered patches of dense shrub cover with abundant shrub/herbaceous edge for foraging. Activity Patterns: Active yearlong; generally most active during crepuscular periods, with some nocturnal and diurnal activity. Home Range: In Madera Co., home ranges averaged 3-4 ha (7.5-10 ac), and rarely were larger than 6 ha (15 ac) (Fitch 1947). Ingles (1941) found that home ranges corresponded to the size of blackberry patches. 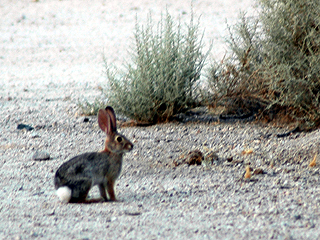 Territory: No data on territoriality found, but cottontails probably are not territorial. Reproduction: Desert cottontails generally breed from December through June, with a peak of activity from March through May (Orr 1940). Gestation period lasts 26-30 days. Females produce 2-4 litters each year of 1-6 young, with an average of 3-4. 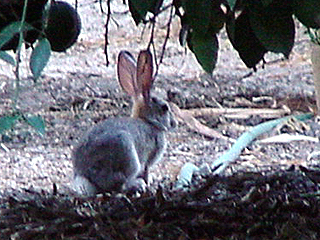 The cottontail's estrous cycle may be influenced by availability of succulent green forage. Yearlong reproduction apparently occurs along the Colorado River and in some other areas adjacent to irrigated alfalfa and other succulent green crops. 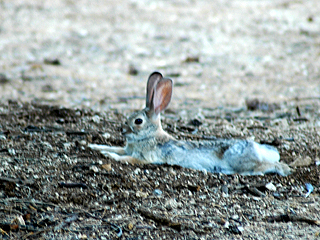 Niche: Desert cottontails are very tolerant of human activity. They may benefit from light agricultural practices and developments that fragment large, homogeneous habitats, increase ecotones, and provide a dispersion of nearby coverts. Cottontail predators are legion. 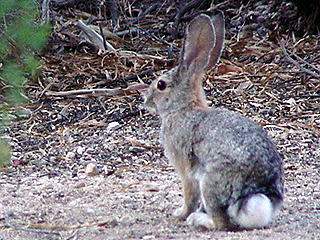 Foxes, coyotes, bobcats, weasels, domestic dogs and cats, hawks, eagles, and owls all commonly catch desert cottontails. Many species of snakes take the young. 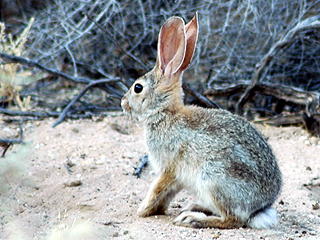 Cottontails may compete for food with sympatric herbivores such as domestic livestock, deer, ground squirrels, hares, and various invertebrates. Cottontails are intermediate hosts for many helminthes, and may contract tularemia and relapsing fever. 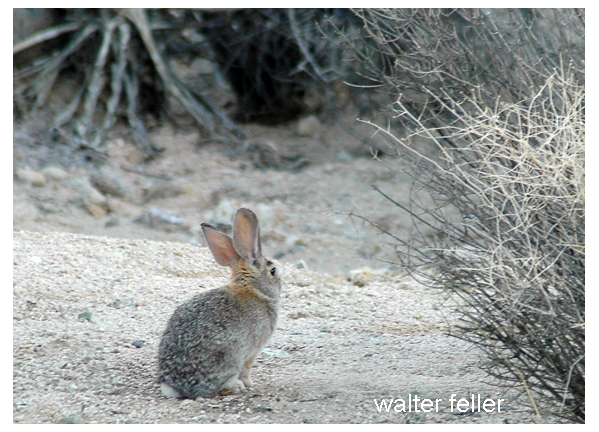 The Desert Cottontail (Sylvilagus auduboni) is the most abundant and well known of the desert mammals. They have a very high reproductive rate (1 to 5 in a litter 26-30 days after mating), a necessity as they are prey for a wide variety of carnivores. They are about 14 inches tall on the average and a large one can weigh up to 4 pounds.